In Low Chicago, a gang of criminals scattered throughout the past threaten the stability of the world in George R. R. Martin's latest Wild Cards adventure. The stakes were already high enough at Giovanni Galante’s poker table that night in Chicago. Poker. Dealer’s choice. Seven players. A million-dollar cash buy-in. But after a superpowered mishap, the most high-profile criminals in the city are scattered throughout the past and their schemes across time threaten the stability of the world. 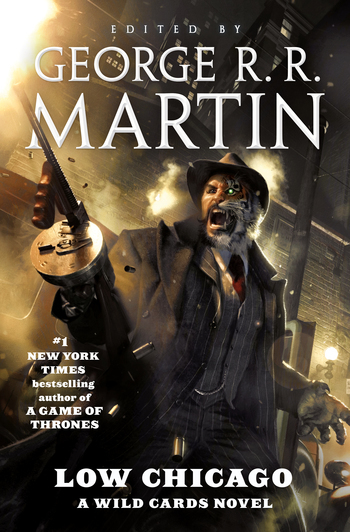 Co-edited by #1 New York Times bestselling author George R. R. Martin and Melinda M. Snodgrass (screenwriter, Star Trek), Low Chicago features the writing talents of Saladin Ahmed (author of the bestselling comic Black Bolt), Paul Cornell (screenwriter, Doctor Who), Marko Kloos (author of the bestselling Frontlines series), John Jos. Miller, Mary Anne Mohanraj (Bodies in Motion, The Stars Change), Hugo, Nebula, World Fantasy and Theodore Sturgeon Award finalist Christopher Rowe, Kevin Andrew Murphy, and Melinda M. Snodgrass.